Departure from Windhoek in the morning (07:45 hrs) and drive via Witvlei and Gobabis to Zelda Guestfarm 25 km away from the Buitepos/Mamuno border post. In the afternoon game drive on the farm. After a short rest dinner will be served. Dinner/bed/breakfast at Zelda Guestfarm or similar. Early departure. After the border post procedures, the drive will continue via Tshootsha (formerly Kalkfontein), Ghanzi and Toteng to Maun. In the afternoon there is time available for a scenic flight over the Okavango delta. (We offer this flight optional). Dinner/bed/ breakfast at Sedia Riverside Lodge. After an early breakfast you will be picked up from the hotel by a vehicle of the lodge and drive to Mogotlho Safari Lodge, nestled in-between a Leadwood forest, overlooking the Khwai River and beyond which joins the Moremi game reserve. 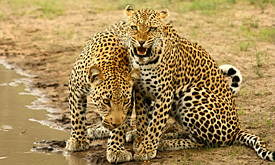 In this private concession area you can find elephants, hippos, wild dogs, giraffes, leopards, lions and numerous antelopes as well as a big variety of birds. 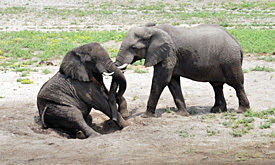 Activities at the lodge include morning and afternoon game drives, as well as after-dark spotlight game drives in the private concession and into Moremi or Savuti, not forgetting the drives along the Khwai River. Full board incl. activities at Mogotlho Safari Lodge/ Mankwe Bush Lodge/ Tuskers Bush Camp. This day is spent at Mogotlho Safari Lodge incl. activities. Full board incl. activities at Mogotlho Safari Lodge/ Mankwe Bush Lodge/ Tuskers Bush Camp. After breakfast transfer back to Maun. 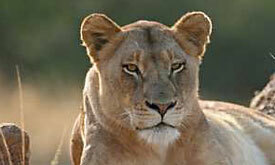 Change of vehicle and drive via Motopi and past the Nxai Pan Park, Makgadikgadi Pans National Park and Gweta to Nata. 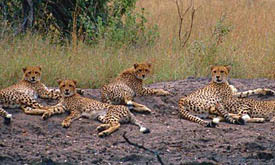 In the afternoon 4×4 vehicles will take the group to the nearby pan area for a nature drive. Dinner/ bed/ breakfast at Pelican Lodge/Nata Lodge. After breakfast the tour will proceed northwards through the Sibuyu Forest Reserve, the Kazuma Forest Reserve and the Kasane Forest Reserve Extension to Kasane. After lunch time to relax and in the afternoon you will be taken on a boat trip on the Chobe river in the Chobe National Park. Full board incl. activities at Bridgetown Resort. 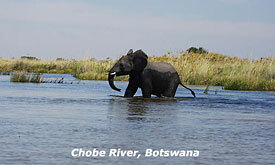 After breakfast, an excursion in 4×4 vehicles into the Chobe National Park. In the afternoon another boat trip on the Chobe. Bed/breakfast at A’Zambezi River Lodge. 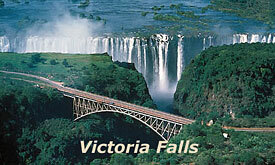 Drive from Victoria Falls via Kasane, Ngoma Bridge, Katima Mulilo and Kongola to Namushasha River Lodge. In the late afternoon sundowner boat trip on the Kwando River. Dinner/ bed/breakfast at Namushasha River Lodge. In the morning time at leisure. 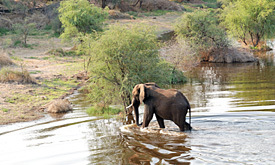 In the afternoon board a boat to cross the Kwando River, where an open 4×4 game drive vehicle awaits you inside Bwabwata National Park., the largest park in the Zambezi region. The game drive is ended with a short return trip by boat to the lodge. Continue via Kongola and Bagani to the Nunda River Lodge. Afternoon at leisure. Today excursion into the Mahango National Park by safari vehicle. Dinner/bed/breakfast at Nunda River Lodge/ Mahangu Safari Lodge or similar. Visit the Popa Falls and proceed to the Taranga Safari Lodge near Rundu. dependent). Dinner/bed/breakfast at Taranga Safari Lodge or similar. 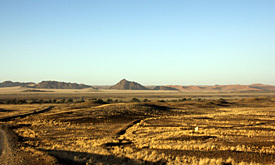 the Gabus Game Ranch close to Otavi. In the late afternoon sundowner drive. Dinner/ bed/breakfast at Gabus Game Ranch. Travel via Otavi, Otjiwarongo and Okahandja to Windhoek.